On 24 November 2014, the shareholders of the Indonesian oil palm plantation company BW Plantation Tbk. will be asked to agree to a new rights issuance to finance the take-over of Green Eagle Holdings. To inform BW Plantation’s present shareholders about several risks associated with the proposal, Chain Reaction Research (CRR) is releasing this Initial Risk Analysis. On 24 November 2014, the shareholders of the Indonesian oil palm plantation company PT BW Plantation Tbk. will be asked to agree to a new rights issuance to finance the take-over of Green Eagle Holdings. To inform BW Plantation’s present shareholders about several risks associated with the proposal, Chain Reaction Research (CRR) is releasing this Initial Risk Analysis. The take-over of Green Eagle Holdings by BW Plantation will turn BW Plantation into the third-largest oil palm plantation company listed on the IDX in terms of planted areas. As the two dominant shareholders of BW Plantation, the Widodo family and the Rajawali Group own the majority of the shares. Public shareholders have no means to oppose the take-over and rights issue. However, we conclude that the whole proposal is mainly advantageous for the Rajawali group, who will sell Green Eagle Holdings for an inflated price and will emerge as the majority owner of the expanded BW Plantation. The price paid for Green Eagle Holdings may too high, as this company is losing profitability and the price is based only on the potential upside of its claimed land bank. For 70% of its land bank, permits are not yet secured to start oil palm planting, and it is far from certain that they will be. In addition, while this initial analysis reveals serious concerns in relation to peatland development, deforestation and encroachment in orangutan habitat, these sustainability risks linked to the expansion are not disclosed by BW Plantation. Given the tendency among major palm oil buyers to adopt policies that exclude palm oil related to deforestation, peat land and social conflicts, this lack of disclosure is reason for serious concern. If these issues are not addressed, BW runs the risk of losing its main customers in ways that would affect the company’s net income and return on equity. Furthermore, the absence of a clear sustainability policy could also deter financing from international banks, some of which have instituted sustainability screens on investments in the sector. As the enlarged BW Plantation will need new bank loans or bonds to develop its unplanted land bank, a lack of investment funds could have strong implications for its share price as well. Existing shareholders, who will see their influence significantly diluted through the rights issuance, may consider opposing the rights issue proposal. We believe that the sustainability, governance, and financial issues presented here pose significant risk for present and future shareholders. In early 2014, a Greenpeace report linked plantations of BW Plantation in Central Kalimantan to habitat loss of endangered orangutans.7 In another incident in November 2014, three orangutans were rescued after being stuck in the midst of clearings by PT Arrtu Energie Resources, a West Kalimantan subsidiary of Green Eagle. The company was reported to not have supported the rescue.8Most plantation companies listed on the IDX have carried out assessments to identify and preserve High Conservation Value (HCV) areas within their concessions. In the prospectus, there was no information on HCV-assessments or biodiversity conversation done by BW Plantation. The unplanted areas listed in Table 1 are possibly inflated, since for 56% of the total land bank (234,000 ha) the licensing process is still in a very preliminary stage: there is only a location permit (Ijin Lokasi). Location permits have a legal date, and often these permits are not converted into real plantation development rights. Unlike many similar reports, BW Plantation’s prospectus does not provide details on the prospects of the unplanted land bank actually being developed. As the valuation of Green Eagle Holdings is mainly based on the potential of its unplanted land bank, this lack of disclosure should be of serious concern to shareholders of BW Plantation. Furthermore, the prospectus does not disclose whether sustainability issues, such as the conversion of peatland, could arise when this unplanted land bank is developed. Given this lack of transparency for these unplanted areas, NGOs will likely link the company to deforestation, peatland clearing, and/or violation of the rights of local communities. This could pose reputational damages to the company and might induce investors and buyers to cut ties with the company. The first step of the Rajawali Group’s strategic expansion plan in the palm oil sector was the consolidation of all palm oil assets under the umbrella of Green Eagle Holdings, which originally was a Singaporean joint venture between PT Rajawali Corporation (Indonesia) and Louis Dreyfus Commodities (France). Over the years, Green Eagle Holdings has built up an oil palm plantation business in Indonesia comprising two CPO mills and a total land bank of 195,540 ha, of which 123,910 ha are currently planted. The second step was the acquisition, in December 2013, of a combined 21.5% shareholding in BW Plantation by two companies registered in the British Virgin Islands: Matacuna Group Ltd. and Pegasus CP One.18 In September 2014, it was revealed that both companies are actually owned by Rajawali Corporation, which thereby became the second-largest shareholder of BW Plantation.19 The largest shareholder is still BW Investindo, the investment vehicle of the Indonesian Widodo family, which founded BW Plantation with 34.9% of the shares. The third step is the sale of Green Eagle Holdings to BW Plantation, to be financed by BW Plantation’s issuance of 27 billion new shares. Formally, this acquisition and share issuance plan has to be approved during BW Plantation’s shareholder meeting on 24 November. But this is just a formality as the two biggest shareholders, the Widodo family and Rajawali Corporation, control more than 56% of the shares and can therefore push through any decision. For the Rajawali Group, the whole reverse take-over plan has several significant advantages. First, it will receive IDR 10.5 trillion for the sale of Green Eagle Holdings, about half of which has to be reinvested in buying shares of BW Plantation, as well as the consent of the Widodo family. A portion is possibly needed to repay the bank loans of ABN Amro Bank and Credit Suisse, but it is likely that a significant profit is made on the sale of Green Eagle Holdings – although 70% of its land bank is not planted and there is no certainty that it will ever be planted (see section 3). For the present public shareholders of BW Plantation, the reverse take-over plan is mainly disadvantageous. While they have the formal right to decide on November 24 on this far-reaching acquisition and share issuance proposal, in practice they will have little influence. They can either invest a considerable sum to buy six shares for every share they now own, or accept that the massive issuance of new shares will dilute their shareholding percentage to one-sixth of the original percentage. Given that the valuation of the palm oil assets of Green Eagle Holdings (IDR 10.5 trillion) appears too high,23 and the additional investment needed is prohibitively large for many shareholders, a significant portion of the new shares might not be taken up by existing shareholders. This will become more likely when shareholders realize that many sustainability risks are not properly disclosed in the prospectus (see section 2.2), and that these risks could also increase the financial risks for the shareholders of BW Plantation (see section 4). The rapid expansion of Indonesian oil palm plantations creates serious environmental and social problems: vast amounts of valuable forests are converted into plantations; habitats of protected species are endangered; significant greenhouse gas emissions are caused by peatland development; and many communities lose access to land which is crucial for their subsistence and to which they have held legal or customary rights for generations. In response to these issues, many large palm oil trading companies (e.g. Wilmar, GAR, Cargill, Bunge and IOI) as well as consumer companies are adopting No Deforestation, No Peat, No Exploitation policies for their supply chain. Despite these changes in the palm oil industry, BW Plantation does not publish any information on its environmental and social policies or practices. This lack of disclosure could have serious financial consequences for the existing and new shareholders of BW Plantation, as is discussed in section 4. The sustainability risks identified in section 3 could catalyse different scenarios, which could have severe impacts on the financial performance of BW Plantation. The company could be potentially confronted with government fines, revoked licences, and a loss of investment and market share. Investors should recognize that the company runs the risk of potentially being confronted with these issues in the future. For instance, the company runs the risk that it will have to pay compensation costs to the Roundtable on Sustainable Palm Oil (RSPO). Green Eagle Holdings Pte. Ltd. has recently applied for RSPO-membership and BW Plantation has been an (inactive) RSPO-member since 2008. In order to create a level playing field among its members, the RSPO has adopted a procedure for compensation by companies that have previously cleared land without conducting High Conservation Value (HCV) assessments. In a forthcoming report in December 2014, CRR will further analyse the financial risks mentioned here, in addition to other scenarios associated with BW Plantation’s performance on social, environmental and governance issues. One of the scenarios that will be explored is the potential loss of major customers and market share. Figure 1 shows the main customers of BW Plantation, as compiled from the prospectus. Since late 2013, several industry leaders, such as Wilmar, GAR, Cargill, Bunge and IOI, have committed to protect of areas of High Conservation Value (HCV), High Carbon Stock (HCS) and peatland. These zero-deforestation policies are stricter with regard to sustainability than the criteria of the RSPO, and apply to the entire supply chain of the companies. 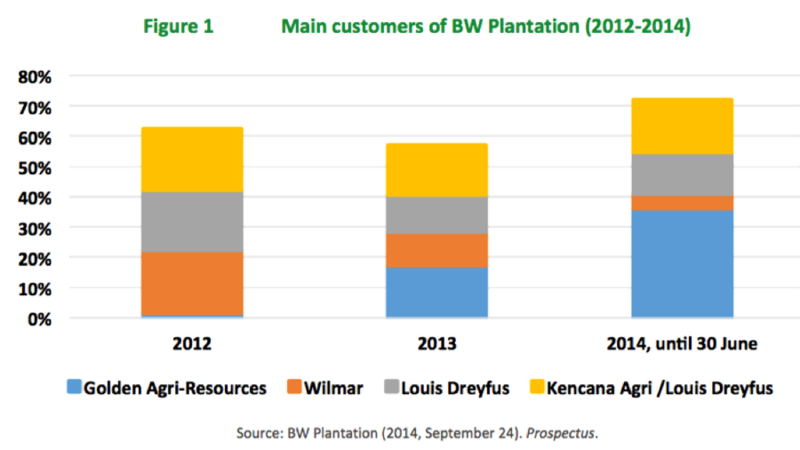 As the figure above shows, more than 40% of BW Plantation’s revenue in the first half of 2014 was derived from sales to Wilmar and GAR, a bump up from 30% in 2013. If the new company wants to continue supplying palm oil to Wilmar and GAR, these companies will require that zero-deforestation policies be upheld. If the company loses access to these traders, it would have serious impacts on the company’s net income and return on equity. Another scenario that will be explored further concerns the challenge BW Plantation might face in attracting external funding to develop its unplanted land bank. The massive rights issuance the company is now planning will strengthen its equity but will not yield substantial revenue to finance further development of its plantations since almost all proceeds will be paid out to the owners of Green Eagle Holdings. The company is planning to attract bank loans to finance this development, but it could also issue bonds. Similar to larger palm oil traders, many international banks and investors active in the sector are increasingly adopting policies that require companies to meet basic social and environmental criteria. The principal banks of Green Eagle Holdings, ABN Amro Bank (the Netherlands) and Credit Suisse (Switzerland), both have sustainable palm oil policies in place. The enlarged BW Plantation has not disclosed any information on its social and environmental performance, but this report lists preliminary indications of serious sustainability risks (see section 3). When more information is disclosed, banks may reconsider further lending. Since BW Plantation’s share price is largely determined by its ability to develop its unplanted land bank, a lack of investment funds could have strong implications. The reverse take-over of BW Plantation by the Rajawali Group will expand the land bank of BW Plantation, making it the third-largest oil palm plantation company listed on the IDX. Since the two dominant shareholders of BW Plantation are the Widodo family and the Rajawali Group, public shareholders have no means to oppose the take-over and rights issue. However, Chain Reaction Research (CRR) concludes that the whole proposal is mainly advantageous for the Rajawali Group, which will sell Green Eagle Holdings for a high price that could disadvantage shareholders and will emerge as the majority owner of BW Plantation. The price paid for Green Eagle Holdings is likely too high, as it is based on the potential upside of its claimed land bank. For 56% of this land bank, permits to start oil palm planting are not yet secured and it is far from certain that they will be. In addition, CRR found that the sustainability risks linked to this large expansion are not disclosed by BW Plantation. Our initial analysis shows serious concerns in relation to peatland development, deforestation and encroachment on endangered orangutan habitat. Given the movement among major palm oil buyers toward No Deforestation, No Peat, No Exploitation policies, this lack of disclosure is reason for serious concern. When sustainability issues are not disclosed and addressed, the company can potentially lose market share, seriously impacting it net income and return on equity. Furthermore, the absence of clear sustainability policies could also deter financing from international banks, which have also begun to adopt stronger palm oil policies. Since BW Plantation will need new bank loans to develop its unplanted land bank, a lack of investment funding could also have significant implications for its share price. Existing shareholders, who will see their influence significantly diluted through the rights issuance, should potentially consider opposing the rights issue proposal. We believe that the sustainability, governance, and financial issues presented here pose significant risk for present and future shareholders. This report was authored by Jan Willem van Gelder, Glenn Hurowitz, Angeles Toledo and Ben Cushing. This report and the information therein is derived from selected public sources. Chain Reaction Research is an unincorporated project of Climate Advisers and Profundo (individually and together, the “Sponsors”). The Sponsors believe the information in this report comes from reliable sources, but they do not guarantee the accuracy or completeness of this information, which is subject to change without notice, and nothing in this document shall be construed as such a guarantee. The statements reflect the current judgment of the authors of the relevant articles or features, and do not necessarily reflect the opinion of the Sponsors. The Sponsors disclaim any liability, joint or severable, arising from use of this document and its contents. Nothing herein shall constitute or be construed as an offering of financial instruments or as investment advice or recommendations by the Sponsors of an investment or other strategy (e.g., whether or not to “buy”, “sell”, or “hold” an investment). Employees of the Sponsors may hold positions in the companies, projects or investments covered by this report. No aspect of this report is based on the consideration of an investor or potential investor’s individual circumstances. You should determine on your own whether you agree with the content of this document and any information or data provided by the Sponsors. BW Plantation, Annual Report 2013, PT BW Plantation Tbk. BW Plantation (2014, September 24), Investor Update Presentation, p. 4. Available at: http://www.bwplantation.com/investorupdate.php; Raynaldi, B. (2014, September 25), “Costly acquisition”, Indonesia Daily Focus. RSPO, “Manual on Best Management Practices for existing oil palm cultivation on peat”, June 2012, available at http://bit.ly/1FUCTfh; Central Agency for Statistics in the Netherlands, “Emissions passenger cars in 2012”, http://bit.ly/1zf8cj8, http://bit.ly/1tKAEXY, as viewed on 29 October 2014. Indonesian Ministry of Agriculture, “Regulation 26/2007, guidelines for the licensing of plantations”, http://bit.ly/QUlXQT, 28 February 2007, article 11. Raynaldi, B. (2014, September 25), “Costly acquisition”, Indonesia Daily Focus. Presiden Republik Indonesia. “Regulation 60/2012, amendment of No. 10 of 2010, procedures for change to the allocation and function of forestlands.” 6 July 2012. Available at: http://bit.ly/1mYAiWI.